As you might remember, we’re big fans of the Gluten-Free Media Group, one of our sponsors. They run Gluten and Allergen Free Expos across the United States. Their Find Me Gluten-Free app is helpful whenever you’re traveling and don’t know where to eat. And now they have begun Send Me Gluten-Free, a subscription box stuffed full of great gluten-free foods, which arrives on your doorstep every month. We’d like to let Jen Cafferty, founder and CEO of Gluten-Free Media Group, tell you more. Why did you start a GF Goodies of the Month Club? I decided to create Send Me Gluten Free to help people have access to more gluten-free products than what is offered in their local stores. I often hear that people are tired of wasting money on gluten-free products that they don’t like. Send Me Gluten Free allows folks to try numerous products, receive coupons and have exposure to brands they might not have otherwise, so they can make an educated purchase at the store or online. Our hope is that they find a new favorite brand or product that they may not have known about. What kinds of foods do you want to offer to people? Each month we send our members 8-12 new gluten free products to try that will include at least 1 full-sized item. We not only offer full-size and sample size food, but also personal care items, supplements and household products that support a gluten free lifestyle. What kind of experience can people expect when they sign up? Customer service is our first priority. People can expect a positive experience and clear, transparent and timely communication from the time they sign up. It’s also just a nice surprise to get a box full of goodies in the mail each month! We can confirm that. Even after all this time of being gluten-free, I was happy to open this box from Send Me Gluten-Free and see only foods I could eat. To learn more about Send Me Gluten-Free, see their About Us page. And their Frequently Asked Questions. Leave a comment here about why you might be interested in a service like Send Me Gluten-Free and you’ll be eligible for a great giveaway: a free three-month subscription to Send Me Gluten-Free. The winner will be chosen at random on Monday, September 22nd. Update: a winner was chosen at random and informed. Thank you for your comments. I wish this was available in the UK! I’d love to try out new foods each month. Instantly interested and ready to sign up, I hurried to the FAQ, hoping against hope that International Shipping was on offer. Unfortunately not! And so it goes. While slowly getting better, good gluten free foods are difficult to find. I have to order special flour from within the EU and, not only are the prices out of this world (but I’ll pay), but the S & H usually make it so prohibitively expensive that it’s not doable. Please notify me when and if you decide to ship across the pond. Then I’ll sign up! It would definitely be great to be able to sample things first. I love to be surprised by new things. Getting a package that has new food that is outside of my typical routine would be fun and feed my curiosity. This sounds amazing. I would love to try this. I would love to try this service. I have two young kids and this seems like the perfect way to keep us stocked on new and safe snacks. I am always looking for new GF treats and this seems like an ideal way to check out new products! It would be great to try out new items. We seem to be in a GF rut lately. The idea of sampling gluten-free items is wonderful. How often I have bought a full package of something only to throw most of it away because it just didn’t work. I would love to gift this service to a friend who doesn’t have time to shop around for new things. This is so exciting! I have wanted to try a subscription box but have always been held back by the fear that I wouldn’t be able to eat half of the stuff. I would love to send a subscription as a gift to my friend who was just diagnosed with Celiac disease. She’s a pretty picky eater and bread-lover and has been struggling with her diagnosis, and I think this would cheer her up so much and help her see that gluten-free foods can still be tasty! I just recently started a gluten free diet due to my thyroid. This would be a wonderful addition to discover new options for food! Really great idea! My daughter in college just discovered she needs to be Gluten Free. She is so frustrated with trying to navigate this new lifestyle need at college. Having to eat at the dorm makes it so hard for her to eat properly. She is also in the learning stages of what is safe and what’s not, so the box would be a great source of education for her as well. I have a few friends w/ celiac, and I am gluten-sensitive (in my case, I’m pretty certain it’s because of how our wheat has been changed over the years). I live in what amounts to a GF desert, and I would love to try new things to find out about them before I commit to buying them. It is just so difficult to know what is going to work and not work! I would love to win, there are so many GF products, it would be nice to sample before I buy. It’s like Christmas every month except I wouldn’t be getting a gift I can’t use! I love this idea! I hate spending money on items that we end up not liking, so being able to test things before buying a large container of something is a really great idea, especially for the high price of gluten free items. I SO need snacks for work. The snack machine? Totally pants. It’d be a nice change to the limited options I have in my small town. It would be nice to try things before spending the exorbitant amounts of money that gf companies often charge. It’s really disappointing to spend the $ on something and have it turn out to be terrible. I’d love to surprise my 10 year old celiac daughter with this. A package every month just for her! I love subscription boxes. I always see subscription snack boxes advertised in my Facebook feed, but they’re never safe for me to eat. 🙁 It’s great that someone is finally doing a box for GF people. And I already love the app. I was actually looking for a good GF subscriptuion box yesterday! What perfect timing! My dad and I are both newbies to having Celiac disease and eating GF (me- 8 months, him- 6 months), and we’d both like to try some good-tasting things that we can actually eat! I’ve bought full-sized things at the store, only to find out they’re so-so tasting or quite bad. I hate wasting that money, and I’d love to be able to try things with my dad as a sample size before going out and buying the full-sized version. I’d love to give this a try! I’ve been moving a lot toward subscription services. I liked Graze but was disappointed by the gluten-free selection. This is such a great idea, it allows people with Celiac to try new products that they might not ever try. I rarely try new gf products because they can be quite pricey. Would love the chance to try items before buying them! This sounds great! I’m always a little nervous to try a new gluten free product because I have had some bad gluten free food! This would be a great way to try products and figure out what I like best with very little risk! Because GF snacks are expensive, I find it hard to “test out” new ones. 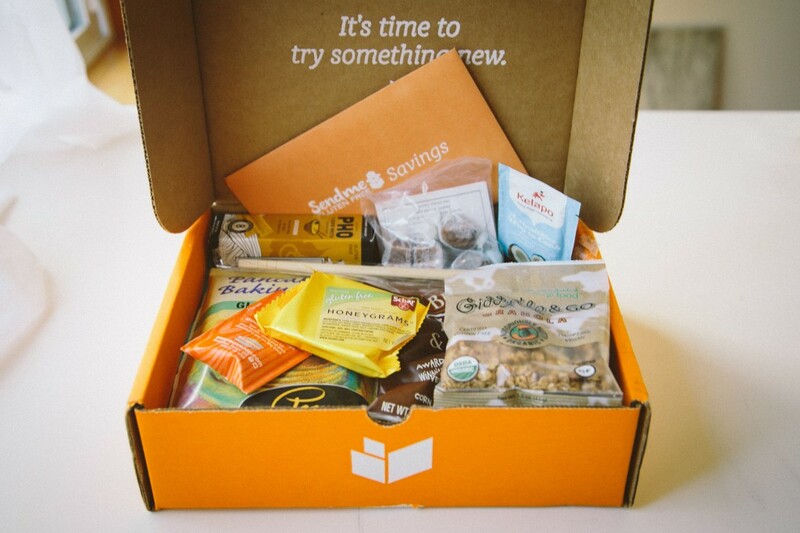 A subscription service like this would be a great way for me to discover new products. My daughter was diagnosed with celiac disease over 20 years ago and I cannot even guess at how many hundreds of dollars we’ve wasted on products that we’re really awful. It would be wonderful for her to be able to try new products without wasting her”young adult” very limited salary. I’m interested and will be looking into this more for sure, it’s hard to know what to buy, just saying gluten free doesn’t mean it’s good! What a great way to get to try new gf products. My husband and I have been trying to find ways to transition away from gluten, but it hasn’t been easy to locate really great products (that we actually LIKE) to help with that transition. I think these boxes would make that search a lot easier! This would be a wonderful opportunity! I was diagnosed with celiac disease relatively recently and am still learning a lot about different gluten-free brands! This subscription service would be a great way to test them out! And who doesn’t love getting a fun surprise in the mail! What a great idea! I have found a lot of GF products I absolutely depend on but it’s always nice to find ones I haven’t heard of to expand my repertoire. It’d be amazing to win! I love this idea because I have spent so much money trying gluten free products and am not always happy with them. I like the idea of trying samples so I can taste them before I spend my money on something I may not like. I also love finding new and yummy gluten free products! What a wonderful idea!! It’s always nice to see the new products that are on the market. I’ve never got to try too many subscription boxes, that would be fun to try something that would be useful. I too have a blog and I love doing food reviews and trying new things. Something like this would be wonderful to try out! I have Celiac and am always looking for new GF goodies. This would be a great way to sample new products. This would be great for a friend who has just been diagnosed and who is finding grocery shopping really depressing right now (I remember how it felt all those years ago when I was first diagnosed). I’d love for her to get a little boost. Always interested in trying gf foods! I’m always interested in trying new gluten-free products, but I often don’t want to commit the money to place a big order online. It would be great to try some new things with minimal commitment. It would be great to sample products. I would share it with my sister and daughter, who are also gluten free. I would love the opportunity to try gluten free products I haven’t heard of or tried before through this service. This sounds fantastic. My son who has celiac disease would be so surprised by this exciting package arriving in the mail! Kinda like a birthday gift for him every month 🙂 our whole family eats gluten free so we would all enjoy it! My best friends are both gluten free, and I’d love to give this to them as a gift! This’d be such fun, and a great way to get over the “what if I don’t like it?” hump! Thanks for the drawing! This would be great to have at work or for just random snacks and a great way to learn new products hitting the market. As I am newly diagnosed, I am trying to figure out a new way of eating and trying different products. This would be great! Just what I was looking for: multiple gluten-free options sent to my front door! What’s not to like? Imagine not having to pay for full-size products that I don’t like. With a celiac son and husband, this would be a great way to try out some new products for both of them. What a great idea to include non food items as well! I love it!! This would be a great bday or Chirstmas gift to some other gluten free people in our family!! I’m always on the lookout for great Gluten free products. I even spy a few of my favorites in this box (pmaelas, schar, etc.) Is that coconut tea in the back right? Would LOVE to try this service out!! I’d love to be able to try products before buying. I’ m so tired of spending money and throwing things out when they don’t work for me. Always looking for new GF snack options, looks like fun, plus who doesn’t love to receive packages in the mail! I love the convenience of “try before you buy”! Some GF products are great; others not so much. Theme boxes would be fun (like baking, healthy snacks, savory seasoning & mixes without gluten, etc.). I just wonder how delivery in a hot/humid climate can be successfully done… foods can get “off” flavors quickly. I love to have single serving snacks in my desk at work for that late afternoon low point. My eight year old daughter was recently diagnosed with celiac disease. We live in a fairly rural area so the availability of gluten free products and support is limited. This has been a struggle, especially because of the fact that she needs to have “safe” foods both at home and at school. While I am always on the look out for any gluten free products locally, it would be fantastic to have various products delivered to our home so that we can experience some variety. With the expense of GF products and having experienced so many GF products taste or texture to be lacking beyond what is tolerable, I feel this sampling-style option from Send Me Gluten Free will help my family spend money on what works and what we enjoy and will allow us less waste as we are finding new products we love! I am very excited to see what comes in each new box! My son is autistic and we r trying a gluten free lifestyle while working on behavioral issues. This would b a fun opportunity to help him transition. What a terrific idea! I can’t count the $$$ I’ve wasted on GF items that have a taste or texture that’s so bad I would have better off eating the packaging. Oh my! This sounds great! I’d love to be able to try a product before I buy a whole box only to find it’s disgusting… I don’t mean that meanly but there are a bunch of nasty foods out there. This sounds like a wonderful opportunity! Thanks for the information and the giveaway. I would love for my daughter and her family to try some gluten free products. Being on a budget, it is hard to spend money on gluten free items only to be disappointed. Sampling first is the way to go! It has always been hard to justify trying new gluten free items when they are so much more expensive, but the reality is I do get bored with what I’m eating. Having 8 to 12 new items to sample on a monthly basis is a pleasing idea! I would love to try out some new gluten free stuff! I get tired of trying new products and feeling obligated to finish eating something I don’t like due to the high cost of GF foods. Samples would be great! What a great way to try out different GF foods. There are so many GF options available now, but not all stores carry them – so what a great way to try them, make sure my daughter and I like them, then request them at our local store. I live in an area where it is difficult to find gluten free items in grocery stores. This would be a great opportunity for me to try new products. I’d like this so I could try new gluten free products. They are so expensive so it would be nice to try some to figure out what I want to purchase. I have never heard about this service before! How wonderful it would be to be introduced to new items! In my area it is difficult to find gluten free products. I was diagnosed with Celiac about a year ago and although it can be challenging, it can be done. New opportunities await! Don’t know if I’m actually eligible (not being a resident of the USA), but I think something like this would be wonderful. I don’t miss most foods, so haven’t been spending hours looking for replacements, but do love the idea of being able to create my own little stash and as I find things I like, getting more of them. That and with a munchkin on the way, I’d like to have options for him/her if needed as well! As I begin to navigate the gluten free world, this would be great to have. Trying things out without having to buy an entire box/bag, etc. is perfect. I live in the midwest where it is hard to find many gluten free options! This box looks AMAZING! I would be interested simply because you would get to try 8-12 new gluten free items per month, that is a huge variety of new things! Expanding horizons from what the neighborhood grocery store has would really be helpful to the gluten free cook (such as myself). I am just starting to eat gluten-free and finding it very expensive. I would love to try new products before spending a ton of money for something I may not like. Learning I need to live gluten-free was quite a surprise. If I’m not careful to remain adaptable, it could be quite an isolating prospect. How cool then that I have happier surprises every month with Send Me Gluten Free! It would remind me that there are a lot of cool folks on this path and companies willing to ride along with us. A box of surprise. I would love that! Feeding a finicky teenager is a constant challenge. Having new foods to sample would definitely keep it interesting! Everyone in our family of 4 is gluten-intolerant. And we live in the middle of nowhere. New gluten-free stuff delivered to our door? Yes, please! I’m sorry, Xiu, but it’s limited to the United States. Terrific idea! I’m in the Black Hills of South Dakota–beautiful country but limited, very limited access, so it’s great to have a way to find out about new products. Thanks! It would be so fun to get to experience foods and treats that I normally wouldn’t associate with gluten-free – and a fun package to get in the mail! what a great way to try new stuff – especially since our grocery stores don’t generally carry new gf foods unless we ask for them (so how do we get to try them first?) great idea! Can’t wait to give it a try!! I am newly diagnosed with Celiac, after at least 20 years of symptoms. I would LOVE the extra help of finding GF food. At this point, I don’t know what I don’t know, which is the worst. Thanks for the service. I’m pretty sure I’m signing up. 2nd of 3 children just diagnosed. She cried into her pillow last night but I told her it’s not going to be that bad. We have got this down pat by now! A sampling box in the mail each month would be just the thing for a 12 yr old to look forward to and take a bit of the sting away. Clever idea! You’ll be glad to know that someone at an art workshop this past week put me onto your site! I need a recipe for the newly diagnosed celiacs in my house hold, so I hopped on to see if you had links. Found this post and checked out their site. Looks smart and good. Winning would be even better. Thanks!!! I love this idea! I am absolutely the person who has 15 half eaten packs of GF snacks in my cabinet because I wanted to try something new but ended unsatisfied. This is the perfect way to expand your GF options without feeling wasteful when something isn’t up to par! I’m a gluten-free starving college student and see SO many GF products I want to try, but unfortunately my wallet doesn’t want me to spend an arm and a leg on something I might not like when I’ve got books and electricity bills to pay for. With this magic box, I’d FINALLY get to try the products I’ve been yearning for! I’m fairly new to eating gluten-free, and would love to try sample gluten-free products! Pretty hard to find GF things where I live. This would be super convenient! i’ve had to be gluten free for thirty years now. and while it’s crazily awesome that you can actually go into stores and restaurants and buy pancakes or a burger or biscuits and have it all be gluten free, it still blows my mind how expensive it all is. $5 for a loaf of bread that is half the size of an artisan whole grain loaf. $8 for a bag of cookies. and now $30 a month for samples?!? holy hot jesus on a waffle . . . I love this! I love trying things before I buy large quantities of something!! Wow, would I love this! Just diagnosed in June with gluten sensitivity, and would love to try this. It always feels like a Russian roulette trying brands that say “manufactured in a facility that processes wheat.”. Some items I react to, and some I don’t. Getting a box of goodies I can eat is a real treat. Wow! I would love to get a box of treats I can enjoy each month. It might take away some of the sting from the huge pile of monthly bills! I rarely buy prepackaged GF products b/c they are usually expensive, but I would love to sample recommended items every month! What fun this would be – it’s like a book club……only with food !!! Why would I be interested? Because this girl loves food and new GF stuff is often welcome! I may be late entering. Thanks for the chance to win. Good luck everyone. This sounds wonderful to this 3+ years gluten free chick.